Nestled in the commuter-belt villages of Surrey – an area favoured today by bankers and City boys – sits a quirky country house which distinguishes itself from the neighbouring mock Tudors and Lutyens. The Glebe House was the home of Robert Harling, a former editor of House & Garden and friend to Ian Fleming, who bought it in 1952. 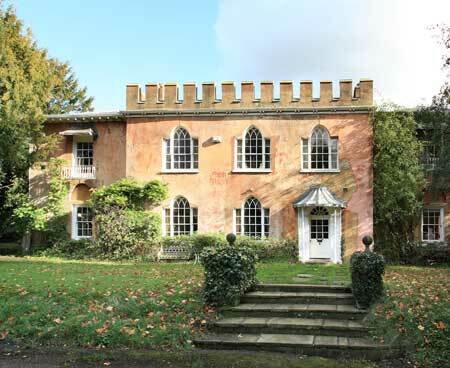 While the colour is weather-beaten, some pink patches defiantly stand out but it’s the roof – which is castellated – that gives the house its eccentric character. Mr Harling met the James Bond author while they worked together at The Sunday Times in the 1930s. He later appeared as the typographer in Fleming’s The Spy Who Loved Me. ‘It was an amazing house to grow up in,’ says Robert’s daughter, Amanda, also a journalist. ‘The woods were perfect for making camps and there was lots of room for ponies, although I was never allowed one,’ she laments. ‘And it’s wonderful for entertaining – not on a grand scale but good for dinner parties.’ Her father would often leave his office in central London and return home to host an eclectic gathering of editors and writers including Shirley Conran and Anna Ford.